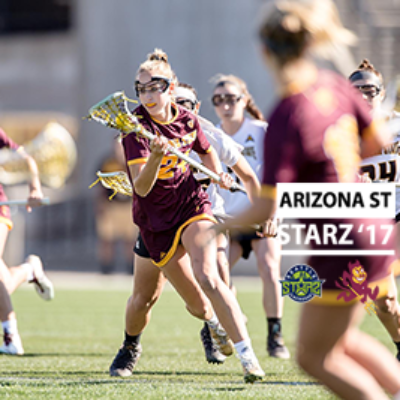 The standout Sun Devil currently leads the team stats in draw controls (52) and both her teammates and the NCAA in ground balls (35), not a bad start to a freshman year AND a program’s inaugural season. How did playing for Seattle Starz help you to be this successful in your first season of collegiate lacrosse, both on and off the field? Playing for Starz helped me to be successful because I have applied the same work ethic and skills that were instilled in me during my time with the club, which has been helpful in all areas of my life. Playing with the group of athletes I was privileged enough to play with and building that chemistry is something I look back on and realize has helped me tremendously in building a new team. What is it like to be playing for a team in it’s inaugural NCAA D1 season? It’s been very fun and challenging playing for a team in it’s first season. Because we are such a young team we’ve all had to step up and become leaders for each other. On the other hand, being able to execute and play together against top teams is really rewarding. The biggest difference is building team chemistry and know how to set your teammates up for success. When you grow up and play with teammates you’ve knows your entire life compared to starting from scratch, it is very challenging at times. Be comfortable with the uncomfortable! College lacrosse is challenging to adjust to, but by embracing the discomfort you will grow immensely and be rewarded if you continue to play hard despite the fears you may have. If you never face your fears head on you’ll never grow. DON’T STOP working. What made ASU the right school and program for you? ASU was right for me because of the many opportunities it provides. Being able to start a new program is a once-in-a-lifetime opportunity that I knew would be a great challenge and also something I knew I would have a significant impact on. Academically, being a part of the honors program and having access to all of the resources it has to offer is an environment I knew I would thrive in. You’ll see some of your 2017 Starz teammates on the field this season. Are you excited to compete against them? I am VERY excited to compete against some of my fellow 2017 Starz teammates. It is really cool to see how their teams are doing and to see them play at the next level. Since the Pac-12 teams are able to play each other twice, I look forward to seeing how our respective teams improve and compete against each other for a second time. My favorite moment is beating Columbia despite being down 7-1 at one point during the game. It was really rewarding and cool to see the whole team battle back from a large deficit against a well-establish program and team that isn’t new to NCAA D1 lacrosse. Question from previous Alumni Spotlight: What was the biggest misconception you had about college lacrosse going into your freshman year? My biggest misconception was how trust can have such a big impact on a team. Whether it’s trusting your teammate to score or trusting your teammate to hold a player defensively in a 1v1 situation. Trust is one of the most important qualities to have in order to be successful and grow. Give us a question for the next Alumni Spotlight.